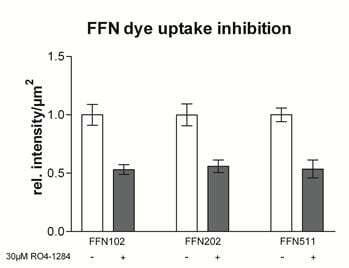 Novel, pH responsive fluorescent false neurotransmitter (FFN). Rodent DAT and VMAT2 substrate. Enables two-photon microscopic imaging of localization and activity of dopaminergic presynaptic terminals in the striatum of mouse acute brain slice. More selective for dopaminergic synapses than FFN511 (ab120331). Exhibits greater fluorescence emission in neutral than acidic environments allowing optical measurement of synaptic vesicle content release. Sufficiently bright, photostable and suitable for two-photon fluorescence microscopy and standard fluorescent microscopy. Compatible with GFP tags. Figure 1: Two neuronal cells stained with 50 μM FFN102 on differentiation day 10. Shown is a sum projection of a confocal z-stack. Accumulation of FFN102 can be observed along the neurites (arrows) and the cell soma (S). Figure 2a: Images in the first row show a group of neuronal cells stained with 50 μM FFN102 (sum projection of a confocal stack). FFN102 localizes to structures on the cell soma (S) as well as neurites (arrows). Z indicates the area zoomed in for an additional z-stack. Figure 2b: Zoomed in area of “Z” from figure 2b. The arrow indicates a globular structure on a neurite. S indicates FFN102 positive structures on the cell soma. ab120866 has not yet been referenced specifically in any publications. Hi! This is the inquiry about FFN102 (Mini 102) product. You say it is a fluorescent substrate. What type of transporter is it substrate for? DAT? NET? OCT1,2,3? Vesicular transporters? Can you give any information about Km? What is the absorption-fluorescence spectrum for it? Unfortunately, your data sheet have no data on that. "Unfortunately we are currently unable to provide any further detail about this product (ab120866). This product is being sold under an exclusive license by Abcam and the patent holders have not revealed any further information about this product as they are waiting for their paper to be published. We would be happy to contact the authors to determine at what stage their paper submission is at and update the researcher accordingly. Alternatively we will try and find out if there is any more information that we can provide, although due to intellectual property and patent issues this is unlikely until the manuscript is accepted. We have an alternative product available, FFN202, where more information is available. It may be that this of interest to the customer? We will update you when the paper is published. Please apologise for any inconvenience to the researcher in the meantime." Click here (or use the following: https://www.abcam.com/index.html?datasheet=120867).